Cheesecake is possibly my favourite dessert other than Eton Mess. It melts in the mouth, is full of flavour and, topping dependent, really compliments the sweetness of the cheese. 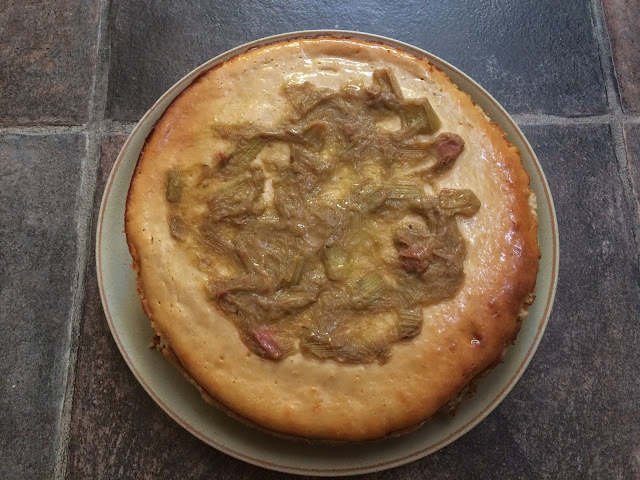 This time of year my parents vegetable garden is practically overgrown with rhubarb so I thought I'd try something different - a sweet cheesecake with rhubarb. I decided the clash of sweet with sour would work really well. I didn't even add any sugar to the rhubarb! Totally biased but I would advise you try this. It's not the most visually appealing cheesecake that has graced the internet but the taste makes up for that. Plus, my basic cheesecake recipe looks much prettier with the berries. 1. First things first, you'll need to preheat your oven to 180 degrees (fan assisted). I also rub a TINY bit of oil inside my cake tin. it shouldn't stick but I never like to risk it. But I mean a TINY bit. 2. Put your digestive biscuits in a sandwich back and break up with a rolling pin. It needs to be as crumbly as possible because this is for your base - you don't want a chunk base, do you? 3. When the biscuits are completely crumbled, melt the 75g butter into the biscuits in a saucepan. When melted and mixed, empty into your cake tin and press down with a fork. Make sure it's not loose so that the base does not crumble too much when cooked. 4. Put your cake tin with biscuit base in the preheated oven and allow to cook for 5 minutes. Whilst this is happen, chop up your rhubarb. 5. Grab another saucepan (or use the same one you use for the butter and biscuits) and add a teaspoon of water. Place your chopped rhubarb in the pan and allow to soften. It'll go to a gooey consistency but that's fine. 6. 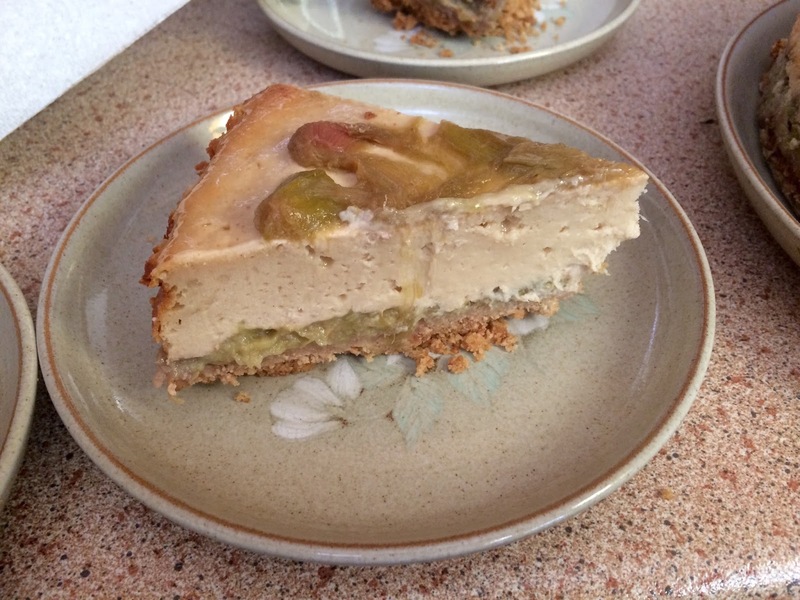 Once the rhubarb is softened, spoon it onto the baked biscuit base. Save a little bit for the top of the cheesecake (which you can see on the photo at the top of the page). Put the cake tin back in the oven for 5 minutes for the rhubarb to set a little. 7. While the cake tin is in the oven, mix your cream cheese, sour cream, soft brown sugar, eggs and vanilla extract in a large bowl. Mix well before adding your plain flour and continue mixing until everything is well combined. 8. Pour this over the rhubarb and biscuit base, baking it in the oven for 35-40 minutes. Leave it to cool down before adding the topping. 9. Once baked, leave to cool a little before placing in the fridge for one to two hours. Cheesecake is best served chilled. Using the last 8 ingredients of the cheesecake makes for a perfect basic recipe, adding whichever toppings suit your taste buds. Let me know if you try this out or post me your favourite cheesecake recipes!